This Palm Springs mid-century modern home features 3 bedrooms and 3 bathrooms and is well-located in the desirable Palm Springs area known as Deepwell, just 5 minutes from downtown Palm Springs. This Palm Springs vacation home is vibrant and bright, with energizing colors and comfortable furnishings. The home is designed for relaxation and vacation combining great design elements of yesteryear with all new updated furnishings, bedding, linens and accessories. Outside, you'll enjoy spectacular views of palm trees and the San Jacinto Mountains and an abundance of comfortable poolside furniture are provided for your enjoyment. 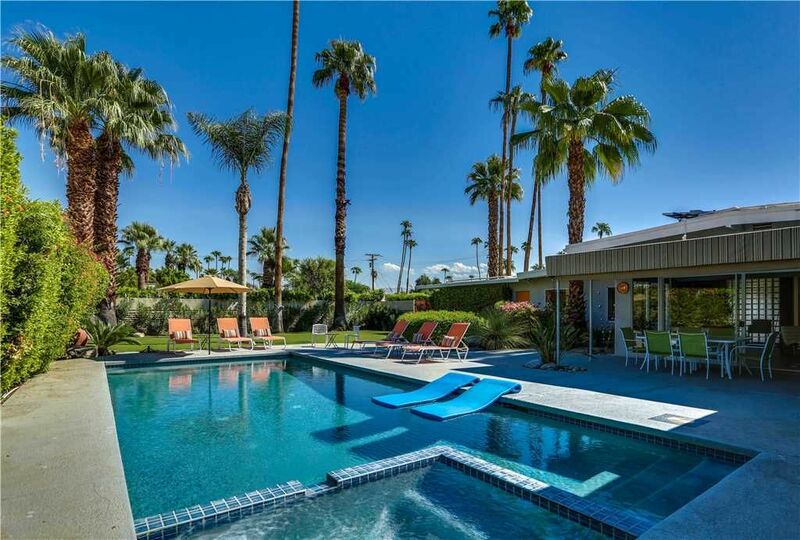 Come experience the splendor of Palm Springs at this private vacation rental home near downtown Palm Springs. Featuring a great, recently redone private pool and spa area, the home's setting offers splendid mountain views. The large backyard hugs the pool and will give you the feeling of being in your own private park. You will find plenty of lush green grass, beautiful trees and lots of room in this backyard for your enjoyment. This home, ""Good Vibrations"" is located in Deepwell, a Palm Springs neighborhood that is south of downtown and known for its quiet and peaceful vibe with well manicured lawns and a wonderful collection of mid-century modern architectural design. Great stay! Great decor and nice furniture, as well as plenty of space & privacy in the backyard. Wonderful, wonderful!! This is our 6th time renting this house for our "girls" getaway weekend and will continue using this house as long as possible. We love the openness of the living room area, nice & bright. The fully equipped kitchen is great. What a nice surprise with all the updates of tile floors throughout & new living room furniture. Modern & comfortable. Love it!! Great Property!!! Quiet neighborhood, awesome yard, comfortable beds, super clean!!! Can't think of a single thing I'd change. We Loved Good Vibrations for the private pool/spa with mountain views. We also like Deepwell because we can easily bike anywhere we want to go in town. The home was comfortable, clean, and relaxing. Some retro flair, but all the upgrades needed to make things easy. Bunnie is spectacular. She'll be booking our PS vacations from now on. The rest of the team was accommodating and gracious. This is our 4th year renting this house and it fits our needs to a tee. We're "active senior citizens" and just love the openness and visual effect while sitting in the living room area. It's kitchen is so well equipped, even when we choose to cook, ha, ha! Love it!! Everyone is always very polite and professional, always willing to accommodate us. This time I spoke to Ashley. Wonderful!